If you experience diarrhea every time after you drink milk, there is probably an underlying condition. Lactose intolerance and milk allergy may be the culprits. Often confused as the same thing, they are quite different and both can cause diarrhea after consuming milk. Why Do You Get Diarrhea After Drinking Milk? A milk allergy occurs when you have a reaction to a milk protein, either whey or casein. Diarrhea is one of the most common symptoms of milk allergy. While milk from any mammal can cause the condition, cow’s milk is the most common culprit. Signs and symptoms typically surface between five minutes to three hours after eating or drinking food containing milk. If you suffer from lactose intolerance, it means you have difficulty digesting the sugar in milk. It is a digestive system problem. However, milk allergy is related with your immune system. In this condition, the antibody called immunoglobulin E takes proteins in milk as bad substances and tries to expel them out, causing immune responses. Because they seem alike but are actually very different, you should not diagnose it on your own. Diarrhea after drinking milk is a symptom of both conditions and only a doctor can determine which one you are suffering from. Lactose intolerance is not curable, but this does not mean it is not manageable. There are several ways to control your symptoms and avoid triggers. You may need to try a variety of techniques before finding the one that works for you. The average person can have a daily amount of 10 g of lactose, so you should consume fat-free, skim, and low-fat milk that contain less lactose. You can also consider eating cheddar cheese which has only 0.9 g of lactose per serving. Experiment with a little bit at first to see how you react. Sometimes something as simple as consuming milk or milk products with another type of food will counteract lactose intolerant symptoms. For example, eating oatmeal with milk, or cheese with bread may alleviate the severity of your body’s reaction. Instead of chowing down on a big hunk of cheese and washing it down with a tall glass of milk, consider eating small amounts of milk products throughout the day. Often, lactose intolerant people will find this eliminate symptoms. There are several types of reduced lactose milk products on the market. 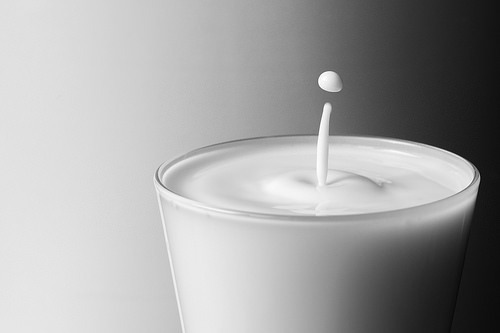 For some individuals, drinking this type of milk or eating products made from it does not trigger their symptoms. However, you should be careful if you have diabetes, because consumption of these products can raise sugar levels. There are several substitutes available, such as nondairy creamers, soy milk, almond milk, soy cheese and tofu. The thing to note is these products often do not have the same nutritional benefits as milk. There are lactase dietary supplements that aid in the digestion of lactose. The supplement can be a pill chewed before consuming milk-based products or drinking milk. Some other supplements are liquids that can be added to milk before drinking. You can try different products and see which one is best for you and by this way, diarrhea after drinking milk will be greatly improved. Note: If you suffer from lactose intolerance and avoid anything related with milk, be sure to take supplements containing vitamin D, calcium, riboflavin and protein. You can also add foods rich in these nutrients to your diet to prevent a deficiency. If you are suffering from diarrhea after drinking milk caused by milk allergy, the only way to combat it is avoiding milk. Because milk is a commonly used ingredient in several foods, this can be a difficult task. Some individuals can eat some products made with heated milk like baked foods, or processed milk like yogurt. Your physician can help you identify foods to steer clear of. In case you do accidently eat something that contains milk, keep antihistamines nearby at all times to prevent allergic reactions and symptoms. This medication can help if taken immediately after the consumption of a milk product. If your allergy is severe, you may suffer from anaphylaxis. This is a serious allergic reaction that can result in swelling throat and blocked airways. In this case, it is important to carry a life-saving injectable epinephrine with you all the time. Your doctor can instruct you on how to use it if ever needed in an emergency.